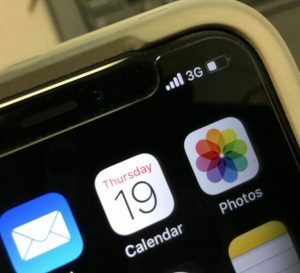 Suddenly, after many years of waiting, GCI turned on its 3G wireless service Tuesday without telling anyone in Galena. There’s a GILA connection. Kind of. Seems that senior Mariah Wigley was in a mood she called “salty” on Monday night, and in her texts with fellow senior Reese Sam-Marks about the lack of cellular data service in Galena, Mariah suggested that Reese send GCI a tweet. Which is what Reese did, tweeting to GCI and asking when they are going to turn on 3G in Galena. The next morning, on Tuesday, a GCI representative tweeted back, saying they are working on it. And later that evening, GCI turned on its 3G service. Coincidence? You make the call. The Hawk Highlights tried to contact GCI several times in class today (Thursday, April 19) to ask them about the new service in Galena, but we weren’t able to find a company representative. The word got out in Galena via the traditional Bush telegraph. Students were happy with the news. We interviewed four students about having 3G and all four of them said they found out about having 3G from people talking about it. After learning about 3G, all four students said they pulled out their phones and checked social media. All of the students except one that we interviewed said that they would be on their phones more often. Jason Harris, assistant principal of Sidney C. Huntington School, said that a former student visiting the school told him about advent of 3G wireless. Mr. Harris said that he would have to confiscate more phones now that everyone will be on it more often. The 3G service only works with GCI accounts. Phone users with an AT&T account can’t access the new service. Mr. A contributed to this story.